Want to join the History Group? 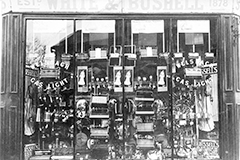 Chislehurst has a long and interesting history, with records stretching back over a thousand years. There is a wealth of information about Chislehurst, its people, buildings and environment, with plenty already uncovered, and much more to be found. The image above is of some of the history group on an outing to St Michael's Abbey, Farnborough. A study of local shopkeeper Felix White by Clare Sands. Guests at the book launch of 'Secret Chislehurst' revealed this beautiful little jewellery box. It was inscribed as a gift from Empress Eugenie in 1872, the time when she lived in Chislehurst. Heritage Lottery funded project around the 1893 map of the Camden Park Estate, including restoration of the map. Read the enthralling journey starting here... and see this video featuring Dave Miller who owned the indenture here... Without Dave Miller contacting us none of this would have happened. Cataloguing information about Chislehurst-based architects and their drawings. A summary can be found here... The drawing shown here is of an Ernest Newton house in Camden Park Road. Reproduction of articles from old magazines. We found an interesting article on the history of Chislehurst Police, in Bygone Kent (vol 15;2) from 1994. We have reproduced it here. Because police support was at one time provided from Mottingham, the police were known locally as the Sheriffs of Mottingham! Two High Street Heritage Trails, including one for schoolchildren, were produced in Spring of 2014. In the log books of St Nicholas Primary School we discovered a former pupil who lost his life on the Titanic. His name was Owen George Allum. He was 17, 'a scholar here for some years', the headmaster writes, 'the children are bringing their pence to make a small donation to the Lord Mayor's Fund. Owen was a passenger on the Titanic and is not among the saved'. Owen had lived at 1 Calderwood Cottages, Holbrook Lane. His body was recovered and is buried in Cornwall where his family came from. He was a gardener, travelling to see his father in New York. In 3rd Class, he didn't stand a chance. 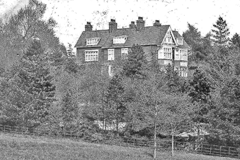 A rare image of Newlands, the Chislehurst home of the Chubb family, great benefactors to the Methodist Church, Farringtons School and more besides. The house stood on Prince Imperial Road.